A darling envelope to store one's nightgown! 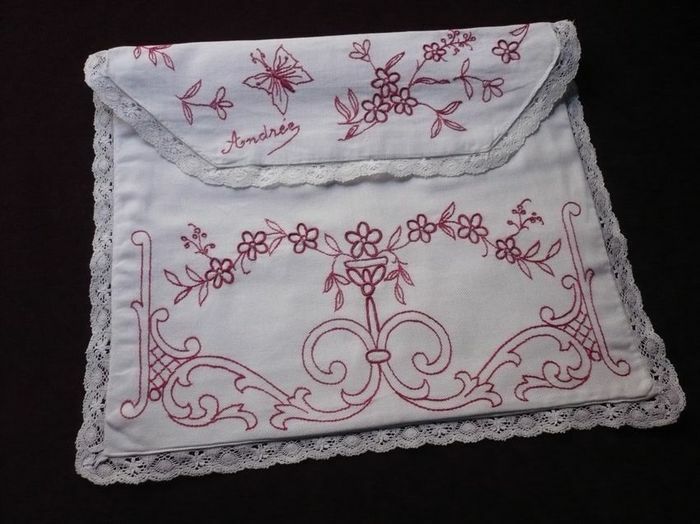 This very charming piece in made of a white cotton piqué and embroidered in red with flowers, butterflies, arabesques and the monogrammed name, 'Andrée.' The edge is bordered in a fine bobbin lace and two small mother-of-pearl buttons fasten underneath to secure the flap. Lined in white cotton. Most likely dating from the early to mid 20th century from the Alsace region of France where this type of red folk-art embroidery was very popular, this lovely envelope is in impeccable condition. Dimensions: 14.5 x 12.5in.